There are 6 posts tagged mastery (this is page 1 of 1). Two years back, I was fascinated by people creating sketchnotes and I wanted to learn how to create them. I was unaware of what goes into creating a great sketchnote but I decided to give it a try anyway. I remember taking up a quote and creating some rudimentary visual which I then shared on Twitter as a showoffable outcome. A couple of generous folks appreciated and that feedback fueled further exploration. I then explored more to learn about structure. My second sketchnote was incrementally better than the first one. It had a structure, some use of typography and separation of key ideas. I pushed it a bit further, one step at a time, by exploring visual metaphors, learning from the community, getting better at image quality and editing/coloring them using digital tools. And then, they started getting noticed. Each step fueled the other resulting in a body of work that I am incredibly proud of. I never felt overwhelmed along this journey because I was doing it for the joy of doing it. I wanted to get better and at the end of every iteration, I wanted myself and the world to see an improved outcome. I was pursuing what Robert Twigger calls “Micromastery”. This approach has served me well while learning how to write, speak in public, play a few songs on harmonica (mouth organ), sing solo and play a guitar. Truth is, that is how we learn as kids. I can see my 5 years old son dabbling into so many things, learning in small increments and then improving upon it. He doesn’t want to be a specialist. He just wants to explore whatever interests him. His latest fascination is drawing the Amazon logo and he is getting better at it. His eyes shine when he succeeds at creating stick figures. The book nicely explores different facets connecting micromastery to dynamic learning, getting into flow, polymathism (Neogeneralism, multipotentialite) and happiness. In many ways, reading this book was liberating because it tells us that we neither need permission to learn anything nor an overwhelming plan. We just need to find what we love doing, however insignificant, and start pursuing it. If you are a keen learner who is interested in learning wide array of things instead of going just deep, this book is for you. 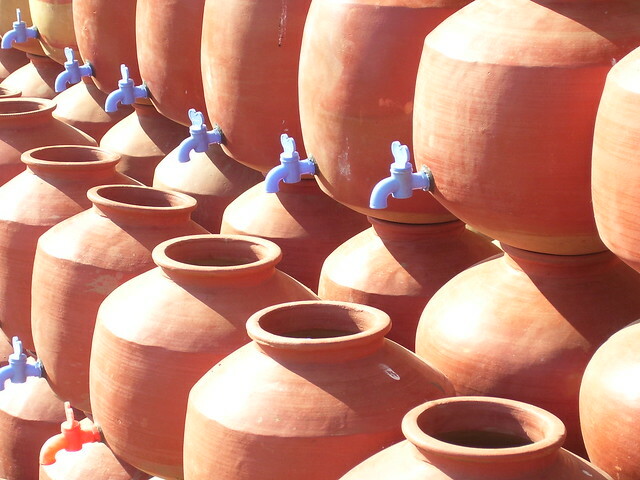 A pottery teacher divides her class into two halves and gives them an assignment to create pots during the semester. One group was asked to focus on perfection of the pot and second group on number of pots they finished. First group worked hard to create their perfect pot while second group immediately started making all kinds of pots. End of semester, two groups were judged based on their most perfect pot. The pot made by second group won. Because they were judged on quantity, they executed more, practiced more and hence, delivered better than those who chased perfection. In 2010, one of my goals was to publish on this blog thrice a week – on Monday, Wednesday and Friday. By committing completely to this schedule, I eliminated the self-discretion associated with it. I did not have to think if I should write on a particular day, because I had to show up and write. No one would have punished me if I failed to write but I still wrote as if someone would. It lead me to read more, connect more and explore more. In situations where we have a choice of not doing and no external penalties associated, we end up compromising. Isn’t this the reason why most people find it difficult to keep their own resolutions? We need an external force to be disciplined in areas that we ourselves feel are important! One of the themes that occupies me is the power of daily practice. Can I do something everyday about things that matter to me? We grow in our careers and learn because we show up for the work and do it daily. We sleep everyday. We eat everyday and it nourishes us. I believe that daily practice is as nourishing– it forms a pattern of activities and these patterns are powerful. They inculcate habits. They ‘train’ us. They help us focus. Whether it is writing, learning a new skill, physical exercise, eating right or pursuing your hobbies, there are few things as powerful as a commitment to do it daily. When we eliminate the choice of doing it, we create space for creativity. We can focus on “how” we do the thing. We can alter our ways. We can make it better. We can adapt and optimize. And then, we learn. So, here are my first two steps in this journey of daily practice. Identify (or acknowledge) things that matter the most. Sometimes, simplifying our lives is just about making things binary – either we do it completely with the whole heart in it or not at all. It is a commitment to overcome the first hurdle – our own resistance. A commitment to do, adapt and learn. I am keen to see what lessons does this journey manifest! 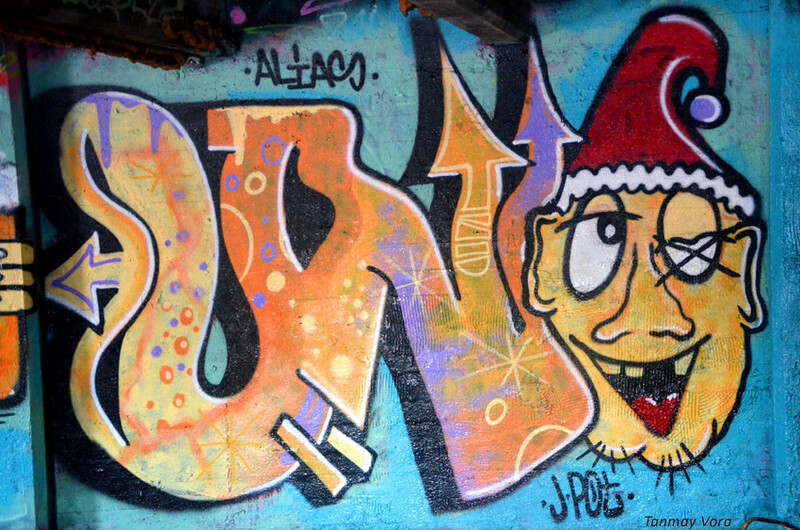 In the Photo: Graffiti art at abandoned factories in Tampere, Finland (Jan 2015). Artists use these dead walls as a canvas for their art to give them a new lease of colorful life. Nek Chand Rock Garden in Chandigarh, India is a true marvel of creativity and innovation. Built by Nek Chand Saini, a self-taught innovator, Rock garden is one-of-its-kind sculpture garden in Chandigarh which almost looks like a miniature of an ancient kingdom spread over forty acres. What makes this truly unique is the fact that all the sculptures in this garden are made from recycled material like ceramic pieces, bottles, glasses, ceramic pots, earthen pots, bottle caps, sinks, electrical waste, crockery, broken bangles, dust, pieces of tar, rocks and pebbles. The garden comprises of twisted, narrow and walled pathways leading to large open spaces. These open spaces house plazas, pavilions, theatre and hundreds of sculptures of men, women, dancers, animals, houses, temples, wells and decorated walls. Seeing hundreds of statues filling the canvas is nothing less than a spectacle. 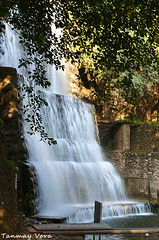 Interlinked and cascading waterfalls nicely complement the sculptures and walls to extend a very soothing ambiance. The description above may sound a bit like a travelogue but it is not just that. It is an intriguing tale of passion, suspense, drama and finally the triumph of creativity over all the odds. A story with an important lesson. Many villages were demolished when Chandigarh, India’s first planned city, was being built according to design by French architect Le Corbusier. Nek Chand Saini worked as a road inspector for the public works department when he started collecting the discarded material from these demolition sites. A few years later, he secretly started working on assembling these recycled material to create a sculpture garden that depicted his vision of an Indian village life. This hobby expanded soon into a full-fledged work of art on a government conserved forest land in the foothills of Shivalik Moutain Range. Since his work was illegal, he kept it a secret for ten long years before it was discovered by city inspectors. As the word spread, people began flocking to see this work of a genius that was already spread in 12 acres of land by the time it was discovered. Amidst the looming threat and uproar of destroying this illegal work that occupied forest conservancy, Nek Chand was able to get public opinion and support on his side. In 1976, the Rock Garden was inaugurated as a public space. Nek Chand was offered a government salary and a staff of 50 laborers so that he can expand his vision and continue his expression of creativity. In 1996, Rock Garden was again attacked by vandals after which city administration took charge of managing the park. Today, with over 4000 visitors daily, Rock Garden is the most visited folk art sites in the world. 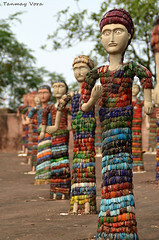 Statues made by Nek Chand Saini decorate some of the best folk art galleries across the globe. It is an inspiring journey of personal transformation from mundane to magnificent. He created a sublime space of innovation and creativity just out of his imagination, creativity and sheer hard work. How many of us today would spend this amount of effort and creative energy in creating something just out of love for doing it? Will we do it without any expectation on rewards or recognition? Nishkama Karma (action performed without any attachment to fruits or results) is the central message of Bhagwad Gita and Nek Chan Saini truly exemplifies it. Did Nek Chand Saini work with a goal of becoming famous one day? Did he plan to win all the awards that he has won? Clearly, he did it just for the joy he derived out of doing it. He simply enjoyed giving form to his ideas through sculptures. He built his legacy one statue at a time. The story of Nek Chand Saini just tells me that our work may not always be a transaction. That if we are passionate about our pursuits, have lot of conviction to do the required hard work and derive joy from simply doing it then external rewards and recognition do not matter. They are merely by-products of doing something you love doing. The journey then, is the purpose and the reward! P.S. : On 15 Dec 2014, Nek Chand Saini, the wizard of creativity completes 90 years! Albert Einstein believed that supreme goal of all theory is to make the irreducible basic elements as simple and as few as possible. Here are some very basic (irreducible) questions that can act as powerful checklist to assess your processes. – Why are we doing what we are doing? – What all we do? – How are those linked together? – How is it done? – What are the dependencies? – Who is the customer? What does customer expect? – What are the top 3 areas where small change can lead to a big difference? – What all is redundant? – What can be eliminated to reduce waste (of effort/time/energy/money)? – What can be simplified? On a second thought, you can also apply these questions to your own set of working patterns/personal initiatives/career. It’s not just organizations that have processes. We also have our personal processes (ways of working), and they play a huge role in what we deliver to the world as individuals. Quality (and hence excellence) is largely a personal affair!